2018 is indeed a great year for technology, smartphones have combatted the annoying notch with different kinds of approaches and propelled AI with more functionality other than understanding your usage and camera. Late 2018 when Huawei introduced the Mate 20 Pro and Mate 20, two flagship smartphones from the highly competitive company of their definition of higher intelligence. We witnessed their outstanding performance with the P20 Pro with its Ridiculous Zoom and powerful performance. After 6 months, Huawei takes on the flagship category with head on to the iPhone XS and Galaxy S9 / Note 9 series with their Mate 20 series. Here’s our full review of this highly received flagship smartphone, specifically the Mate 20 Pro. One distinct appearance of the Mate 20 Pro is at the back, the square / quad-holes in the camera that houses the triple camera system and true tone flash. Along with the more prominent LEICA branding showcases the camera in a more powerful and sophisticated way. Though we missed the P20 Pro’s landscape orientation, we think this is more ideal as you really hold your phone in a portrait orientation more. One innovative approach we love with the Mate 20 Pro is the textured back glass to finally solve the slippery glass texture, it has micro textures similar to tiles that give it a carbon fiber-like finish. This is a great approach as Huawei is definitely thinking over their customers, with our experience with the P20 Pro and even the Mate 10 series, this has been a concern of just being too slippery. But nothing will beat the slippery texture of the OPPO Find X that tends to slide even at the evenest surface. The curved glass at the front enables the Mate 20 Pro to have a more narrow footprint as compared to other phones with similar screen size. Along with the curved metal edges, it’s elegant and premium to hold similar to the Galaxy S9 and Find X but its one step ahead with its textured glass approach. All buttons are located at the right side for easier access using your right thumb, we preferably like this approach more than separating the volume toggle to the other side. A nice touch is the red power button accent, pretty eye catch and even distinctive. At the bottom are the sim tray and USB-Type C port, no speaker grills here as Huawei integrated it with the Type-C hole. We think its a nice approach, it fixes the uneven placement of the sound when facing the phone, but at the same time brings new problems such as the sound is muffled when a cable is connected. The WQHD+ (3120×1440) AMOLED display is a good jump from the previous Mate 10 Pro. Avenue wise, the display is now punchier in colors and sharper as compared to our predecessor. The major difference is the notch which Huawei acknowledges or can be disabled. Overall display quality is superior, it’s similar how well the Galaxy S9+’s display with even better curves at the side for better grip. We have to warn you that since this is AMOLED, you’re more prone to burn-in when playing bot games like Ragnarok Mobile. Another thing you need to look out is the display issue of the green tint at the sides, in due time like a month using the phone you might encounter a greenish tint at the side due to poor glue placement in the display. In our experience, three of our friends had an outright unit replacement and even a small gift for bringing it to the service center. We think Huawei has the concern under control, but still a bummer to encounter with such as hefty price tag. Lastly, on the display, don’t forget to buy a screen protector once the pre-installed screen protector is already scratched up. Since in our review unit, we weren’t the first time users the screen protector was already removed and it was full of scratches already. Deep scratches that are noticeable in white backgrounds, not just cosmetic scratches…which is weird since the unit is Corning Gorilla Glass 5 protected. Powered by the new Kirin 980 and 6GB of RAM, the Mate 20 Pro proved other ambitious flagship smartphones that RAM isn’t everything. Competing against the Snapgradon 845, the Kirin 980 processor boosts AI functionality and better processing by being a 7nm processor and the new Cortex A76 architecture. Along with a dual neural processing unit (NPU), the Kirin 980 processor does more intense AI in analyzing performance in camera enhancement, processing power, battery saving, and more. Nothing but fast, that’s what we can say with the Mate 20 Pro. The performance in multi-tasking even without the performance mode activated. As a heavy user in LTE all day with moderate gaming and casual photography the Mate 20 Pro was able to provide the fast multi-tasking with ridiculous battery life even without the dark mode activated. In the camera division, the Mate 20 Pro has a 40MP RGB camera that is no longer assisted by a monochrome camera. Surprisingly the triple camera setup is now a 40MP RGB Camera, 20mp ultra-wide angle lens and an 8mp telephoto lens of up to 3x zoom and 10x digital zoom. One good feature we love with the Mate 20 Pro is the triple camera implementation and adding the ultra-wide angle lens. The Master AI app can detect if you need to use the wide-angle lens and suggests you switch in some scenarios, something we love especially when handicapped of only one hand in taking photos. Even the ultra-wide angle lens produces outstanding night shots and sceneries. We have to say that the Master AI implementation of Huawei is still one of the best in the industry, taken for granted its saturated colors implementation and over sharpening. Sometimes the night mode with a 3-5 second tripod mode exaggeratedly enhances the photos, even night shots have an overexposed feel which looks artificial. In this night shot, we just prefer the normal shot and just adjust it on Instagram or another app when necessary. Huawei Mate 20 Pro’s battery of a 4,200mAh can definitely last you a day. We had it going for more than 18 hours with still 15% of battery and reaching for the charger. Even as a heavy LTE user, the AI battery saving management does wonderful things to save you on battery life. The AI functionality even adjusts the screen resolution when needed, but in our preference, we just like it at Full HD+ which is enough for good details and won’t get the phone too hot. What amazed us is the charging time of the Huawei Mate 20 Pro, in our 3-way test against the iPhone and OPPO R17 Pro, the new Huawei Super Charge gives an output of 40W charging rate. Enough to full charge the 4,200mAh battery in just 1 hour and 45 mins while turned on and in maximum brightness. While turned off, it only took around 1 hour and 8 minutes to full charge, while this isn’t as fast as the OPPO R17 Pro’s SuperVOOC charging, it’s still fast considering the bigger 4,200mAh battery capacity. Still, this is WAY, WAY faster than the iPhone XS Max’s mere 1A charger that too more than 150 minutes to full charge. So, you’re still fortunate to experience such fast charging with Huawei. The under display fingerprint scanner is a great addition, its well placed on the right spot for your thumb to rest on. It’s fast and responsive as well to our liking, much faster than the first generation Vivo V11 under display scanner. The front camera is also assisted by a flood illuminator and 3D face scanning technology similar to the Find X and iPhone X. So unlocking the device using the face even at dark situations is fast, though we would like it to be a bit more responsive in pitch dark situations by adjusting the screen brightness to act as a flash. We are glad that Huawei still thinks through the functionality and advantage of their infrared blaster in their devices. Ever since their start of implementing this, its been a breeze using it to open and close devices such as TVs, Air-Conditioners especially if you already lost the remote. Huawei shocked the industry when they featured the wireless reverse charging of the Mate 20 Pro, it’s also a funny hit for the iPhone showing that Huawei can “Save the day”. While in our tests, charging an iPhone XS Max can give 5% of battery after 15 minutes while Huawei lost around 11% of battery. We find this more of a gimmick rather than being useful, but it doesn’t stop Huawei to give an edge and being innovative at the same time. 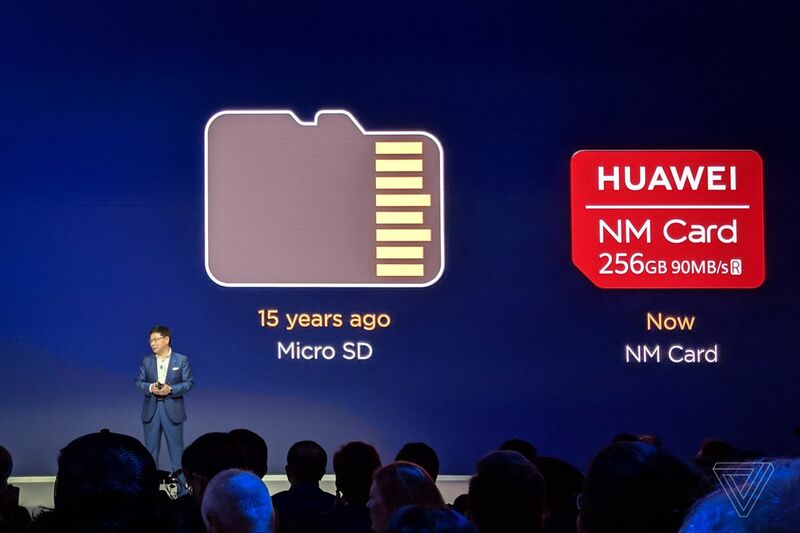 It puzzles us why Huawei had to introduce a new storage card system, their new NM card is definitely smaller but still sacrifices the industry standard. While the MicroSD isn’t lagging down in speed, we think Huawei is just showing off too much with this one, honestly its just a way for the company to earn more should you need more than 128GB of internal storage. The Mate 20 Pro is an outstanding smartphone given the price of Php49,990. You might have some hinderance with the expandable storage of using the NM card or the display issue, but Huawei assures you that they will replace the phone should you encounter the green tint problem. Given its outstanding camera, fast performance, elegant approach and even some surprising innovation like the reverse wireless charging, textured back glass and keeping the IR Blaster made us a fan of the Mate series. We hope Huawei continues this trend as the Huawei Mate 20 Pro definitely makes itself a step ahead from other flagship smartphones in its price point. Huawei definitely knows how to innovate, the right innovation to brag around and not just a one-time hit wonder. We say, when you buy your Huawei Mate 20 Pro, just don’t forget the screen protector to avoid scratches on the curved screen. The Mate 20 Pro still retails for Php49,990, the only smartphone we currently recommend in its price point due to its outstanding value and features. Should you have a smaller budget, its smaller brother the Mate 20 is still a great buy especially with its recent price cut of Php5,000. So for Php34,990, the Mate 20 is great buy by just removing the curved display, downgraded optics and the wireless charging. Huawei definitely knows how to innovate, the right innovation to brag around and not just a one-time hit wonder. We say, when you buy your Huawei Mate 20 Pro, just don't forget the screen protector to avoid scratches on the curved screen. Previous articleCould this be the final design of the Nokia 9 PureView?